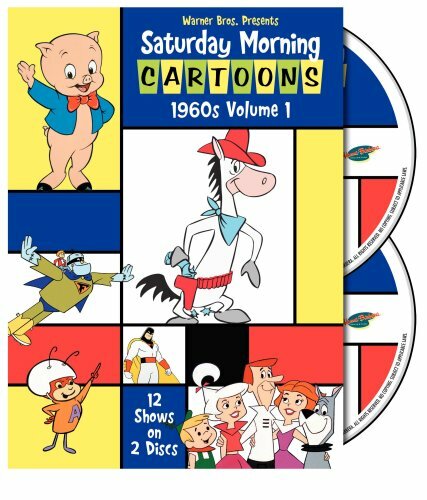 Saturday Morning Cartoons 1960s Volume 1 comes across with a nice group of cartoons featuring a lot of different wild and strange characters in a lot of different wacky situations. Over the two discs are 33 different cartoons from 12 different shows and a full five hours of viewing. A note at the beginning of the disc reveals that some of the original film don't survive in pristine condition so archival elements are used to approximate the original experience. Occasionally it does get a bit rough, but certainly not unacceptably so. Hanna-Barbera Productions, Inc., founded by William Hanna and Joseph Barbera, were the most prolific North American television animation company during the second half of the 20th century and was ultimately absorbed into Warner Bros. Animation. Starting in the early 1960s, Hanna-Barbera Productions produced successful cartoon shows, including The Huckleberry Hound Show, The Flintstones, Top Cat, Tom and Jerry, The Yogi Bear Show, Space Ghost, The Jetsons, Jonny Quest, Scooby-Doo, Where Are You?, and The Smurfs. The shows on this collection bridge the gap between the early days of animation in the slapstick theatrical cartoon and the mass adoption of the "super-hero" cartoons in the '70s. In most of these cartoons, animals rule. Cats, dogs, horses, squirrels, squids, moles, pigs, ducks, woodpeckers, bears, ants, mice, dolphins, and a gorilla join the various humans in their adventures on earth, under sea and in outer space. Over the run of the collection, one can not help but be impressed with the wide range of imagination and creativity that went into these cartoons. The animation seems rudimentary, working within the budgetary retraints of limited animation, compared to today's elaborate computer generated extravaganzas. The character design and backgrounds are simpler and there is a lot of repetition in the animated parts. But, there is still an old-school charm that evokes nostalgia in the oldster and just might provide some entertainment to a youngster. With lesser animation, more emphasis was placed on the overall sound design. The voice work is often delightful and the sound effects are great fun. The music is a wide ranging amount of old fashioned tunes and attempts at more modern material. If you wanted just one nostalgic set of cartoons from the '60s, you could certainly do worse than this set. Two classic series are represented by an episode. We see Fred hit the roof in The Happy Household from The Flintstones, when Wilma get a television job. In The Jetsons, the family get a new maid in Rosey the Robot. Two of the most beloved Hanna-Barbera characters, Porky Pig and Daffy Duck, each make a memorable appearance. Another episode features Marine Boy, a character from one of the first anime cartoons to be shown in a dubbed form in the U.S. One of Hanna-Barbera's earliest efforts, The Quick Draw McGraw Show, is well represented in this set with six episodes. Also getting some space are Quick Draw McGraw's supporting characters Augie Doggie, Doggie Daddy, Super Snooper and Blabbermouse. The whole product is really quite decently outfitted. The cartoons come with English and Portuguese, both in language and subtitle. The extras are nice little tidbits of background with comments and insights from the people who made the shows. The packaging of the set is very attractive with great graphical art, full of color. The Good, The Bad and El Kabong (5m:57s) - A short, but interesting, look at how Hanna-Barbera made the switch from theatrical cartoons to television. The Shocking Electric Monster From Frankenstein Jr.
Saturday Morning Wake-Up Call! (2m:51s) - An overview of the shows on the disc. Monster Rock: The Adventures of Frankenstein, Jr. and The Impossibles (5m:24s) The story of Frankenstein Jr. cartoon that included a hit rock group with super powers. This show demonstration Hanna-Barbera ability to draw their source material from popular culture. Ted Cassidy provided the voice of Frankenstein, Jr.